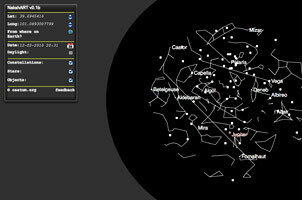 An HTML5 based sky viewer application, NakshART uses canvas, geo-location and local storage to render an interactive browser-based sky map. Cool stuff! This entry was posted on Thursday, December 2nd, 2010 at 6:45 pm and is filed under astronomy. You can follow any responses to this entry through the RSS 2.0 feed. You can leave a response, or trackback from your own site.